Last month, bourbon lovers met for a special whiskey-pairing dinner at Hyatt Regency Scottsdale at Gainey Ranch. On a cool January evening, we were seated under the stars with cozy heaters and soft blankets to experience "Bourbon on the Green" featuring Knob Creek small batch and single barrel whiskey as the starring spirit. 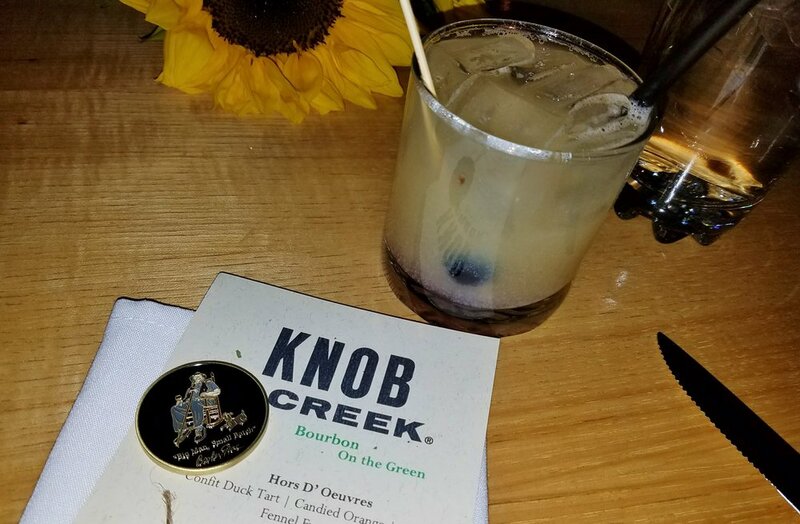 We were welcomed with a custom-designed Challenge Coin and a delightful duo - Bourbon Sours made with Knob Creek 9-Year-Old Straight Bourbon and a flaky duck confit tart with candied orange, fennel, and saba. It set the tone for the rest of the decadent menu to follow, with our hosts Chef Brian Contreras and Beam Suntory expert Anthony DeSantis educating the guests throughout the night on the dishes and pairings. A sculpture of the late Booker Noe, grandson of Jim Beam and Master Distiller for more than 40 years, oversaw our happy group. Bartender Andrew, a fan of director Guy Ritchie, created the "RocknRolla, named for a movie which is an under-appreciated classic." Combining 120 proof Knob Creek Single Barrel Reserve, amaretto, Alessio vermouth, AZ Bitters Lab Figgy Pudding bitters and an orange peel garnish resulted in my favorite cocktail of the night. Chef described our smoked steelhead trout course. He first brined the fish with salt and sugar before smoking over mesquite wood and tossing with grapefruit aioli made with fresh juice and zest. This delicious plate was finished with triangles of toasted pumpernickel, frisée, and Luxardo cherry reduction. Our salad course brought wild arugula dressed with an Arizona honey and apple cider vinaigrette and strewn with roasted and candied hazelnuts, dried cranberries, and Rogue Creamery’s Smokey Blue cheese. To pair with our entrée, Andrew stirred up a Manhattan using Knob Creek small batch rye whiskey. Chef's fabulous porchetta on a bed of warm bean salad and parsnip-apple butter was rolled and seasoned with garlic and herbs, cured with citrus and brown sugar, slow-roasted for six hours, and basted every 45 minutes with bourbon. The addictive crispy-crackly skin was aptly described as "pork candy" by Chef Brian; "the best way to describe it is fatty, meaty Jolly Rancher." A special treat was a bourbon that was as indulgent as the steamed toffee pudding with candied almonds and bourbon ice cream that we were spoiled with for dessert - the Limited Edition 2001, Batch 5. Anthony explained that each batch is made with the same bourbon but what distinguishes it is where it is placed in the rackhouse. "There are only 12,000 bottles of each and if you ever taste them side by side, they're completely different, which is awesome." We were told Damon Thompson, Beverage Manager, chose Batch 5 for us to enjoy because "it's my favorite." 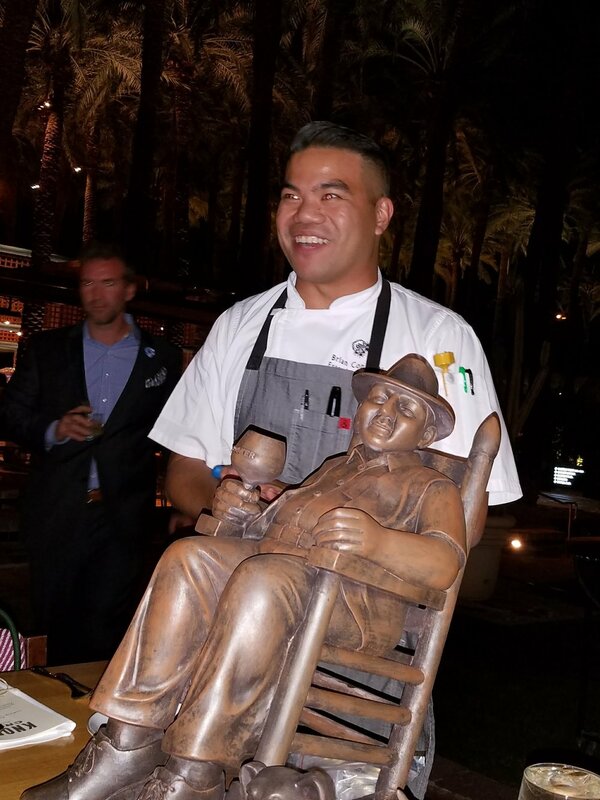 Stay tuned for a schedule of future cocktail dinners and an exclusive hand-picked barrel of Knob Creek that will only be available at the Hyatt Regency Scottsdale Resort & Spa at Gainey Ranch. The resort is located at 7500 E. Doubletree Ranch Road, Scottsdale, Arizona, USA, 85258. Tel: 1-480-444-1234.